Posted byhundredriver	 October 6, 2017 Leave a comment on The Great British Apple Special – This Saturday! We’re back TOMORROW with 28 stalls of locally sourced produce and artisan delights. At this particular market, we’ll be celebrating the British Apple Season with special games for the kids alongside a variety of cooking demonstrations and tasters – not to mention the regular market hamper raffle. Friends Farm locally reared pork will be back along with Yew Tree chicken and those legendary peppered kebab sticks (get in early to avoid disappointment)! Meanwhile, Margaret Bacon will be back with her own recipe book and Brenda Dormer with her delicious home-made cakes. We’re delighted to welcome Danns Icecream and Helens Herbaceous plants. Not to mention a guest stall for the RSPB charity and Shuck Brewery who will be bringing a limited selection of home-made real and craft ales. And if that’s not enough there will be over 20 other stalls of; Locally reared Beef, Lamb, Fresh Veg, Handmade Jams, Marmalades & Chutneys, freshly caught and traditionally smoked fish and cheese, wood turners, carvers & jewellery makers, hand-made Belgium chocolate truffles, pressed apple juice, free-range woodland eggs and various baked goods… phew! Children will be making Apple Pizza’s and faces amongst other games and cooking demonstrations will include a Pan Apple Crumble, Apple leather and a classic Apple Sauce. A BBQ with hot food and drink will be available all morning with ample parking and disabled access. 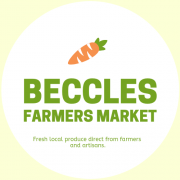 We’re all looking forward to seeing you TOMORROW from 9am – 1pm at Beccles Farmers Market, Ellough, Beccles NR34 7XD.